Proven to be the ultimate outdoor tool that can be used to cut, chop, slash, or smash just about anything. Useful for kiling fish and game and can field dress and prepare them for the table as well. The 13" blade is constructed from SAE 1055 medium carbon steel with baked black anti-rust finish and comes with a serviceable blade that will cut right out of the box and be made hair shaving sharp. The durable PVC compound handle provides a comfortable grip and resists cracking or breaking. 18" overall. Includes heavy duty sheath. looks nice and feels really sturdy in your hands. the only problem that annoyed me was the sticker on it but its not a huge problem i removed it and still had sticky residue but that wont matter once i clean it so 5 stars! I received this kukri as an early Christmas present from my father, it's very sturdy and well balanced. The reason I only gave it three stars is because I was expecting it to be ready to rock right out of the box, instead it came in as dull as a butter knife!!! Even after sharpening it vigorously it still wasn't sharp enough to do it's job. I'm not going to suggest this item to anyone who has a budget of $50 dollars or higher, but if you have a tight budget it's better than nothing. I purchased two of these back in November 2011, and gave one to my father, and one to my wife for Christmas. They are both pleased with them for the most part, but after six months, I have found that my wife's kukri is of a substantially lower quality than any of my other Cold Steel machetes. Also, the handle doesn't seem to be made of the same material. I have been forced to conclude that these Kukri are either from a really bad batch on the factories part, or more likely; Cold Steel forgeries. At the first mention of any concern we have contacted our customer to ensure their order experience is a positive one, and that any matters are well resolved. As always, should there be any problem or concern with a product or otherwise, please contact us and we will resolve it quickly. RE: Cold Steel Kukri Machete. Thank you for visiting our web site and for your business. I am sorry for any problem with the kukri received and can help. If there is ever a problem, question, concern or otherwise, we are here to quickly help and resolve such matters. We are attempting to reach you via phone but the number we have appears to be out of date. We have your phone number as [number removed]. Please reply letting us know the best number to use. We received your "Cold Steel Kukri Machete" review and we would like to talk with you about your purchase. We would like to best understand the nature of any concerns with the item, how it has been used, and so on. Your review states that you feel the item is likely a forgery. That is a very serious claim to make and I assure you that is not the case. 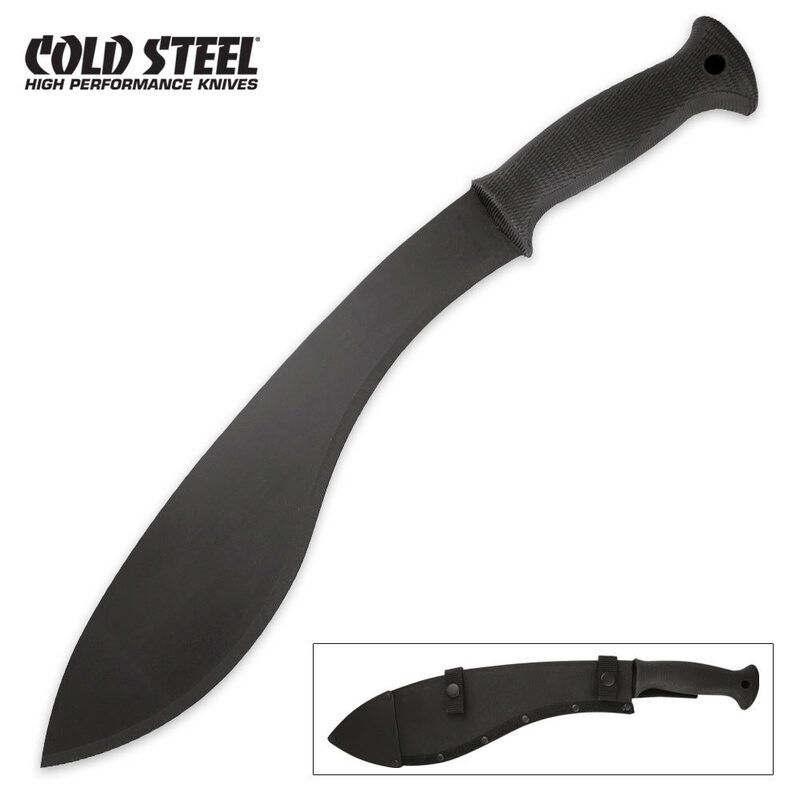 All of the Cold Steel products that we stock are the real deal, genuine Cold Steel merchandise. We have never dealt with fake Cold Steel products and we never will. If there is a defect or problem with your kukri we can fix that for you. We just need to fully understand what is going on with the kukri in question, as well as which type of resolution is best for you. I placed my order for this machete yesterday 3/2/12 and, when I got home from work today 3/3/12 it was waiting on my doorstep. Top notch service from True Swords per usual. Out of the box I noticed the blade wasn't terribly sharp, it sheared paper two or three times then started struggling. Which for a machete is alright I guess but I wanted more, so I got out my whet stones and in less than 15 minutes it had a wicked edge. I know for a fact the edge will hold now for a good long while, as i also have a cold steel warrior katana which I have never sharpened in 2 years with moderate use and its edge is still RAZOR sharp. The steel in these two is the same "medium" carbon 1055 which is flexible but solid, hard but not brittle. This steel makes for, in my opinion, the ideal blade it sharpens quick and and stays sharp. With a little TLC this is an excellent purchase with amazing service. blade isn't really sharp had a small chip handle fixed it good for a chopping knife but it really has a flimsy feel to it at the handle. but the sheath is really nice. An amazing pice of Metal, Deffinitly beats an 8 dollar wallmart machete, it is amazing at chopping wood. It can easilly smash bricks and rocks with the back, non bladed side. I would suggest this for any machete lover, it is amazing. Its quite thick and does not flop around like a wallmart machete, it is ten times better.